Ministry of Propaganda - 20/May/2006: "Back From Wales"
Last Saturday I dropped my sister off in Wales for her horse trekking holiday at the Cwmfforest Riding Centre, today I picked her up again. Despite some quite mixed weather she really enjoyed the week and when possible the views. 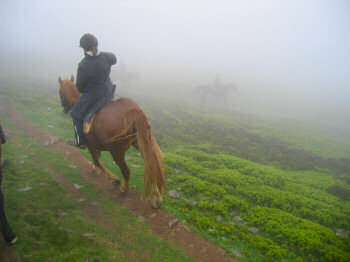 They had sunshine, torrential rain, strong winds, fog, everything you can think of. 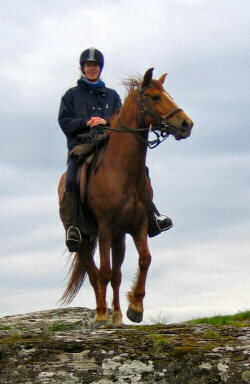 Nevertheless they were out riding every day, covering a large part of the Black Mountains and the Brecon Beacons. Some nights they stayed at the farm, other nights in hotels and B&Bs. The group was quite international with German, Swiss, Canadian and Welsh riders taking part. Early in the afternoon today I arrived at the riding centre to pick my sister up. Most of the other guests had already left, so after a quick good bye we loaded her bags into my car and left. First stop was the White Hart Inn in Crickhowell for lunch. My sister was quite happy with her grilled trout, my roasted chicken was nothing special. Service seemed to be a bit indifferent. Unfortunately not a pub we're likely to return to. Our next stop was the Forest of Dean Model Village & Gardens near Lydney in Gloucestershire, close to the Welsh-English border. This turned out to be very nice: While probably more intended for families with children we still enjoyed the various little scenes from the Forest of Dean. There are various places like villages, famous pubs, coal mines or a Roman house. 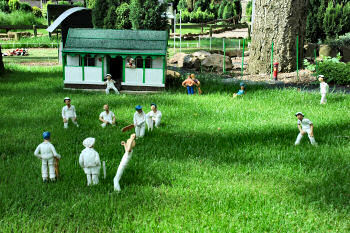 The replicas of local buildings and landmarks as well as the little people populating them are made with a lot of attention to detail, but there's also a fun aspect. We didn't pick up a form, but we saw children completing an 'I spy Quiz'. The weather forecast for Sunday isn't very promising (Is that an understatement for 'atrocious'? Ed. ), not entirely sure yet what we're going to do tomorrow. Probably a lazy morning and then we might drive to Oxford to visit a museum, something like that.